Pink Tea Latte: Gurly's Life | Starting off my Birthday week with my Bakery Picks for Cake! Gurly's Life | Starting off my Birthday week with my Bakery Picks for Cake! 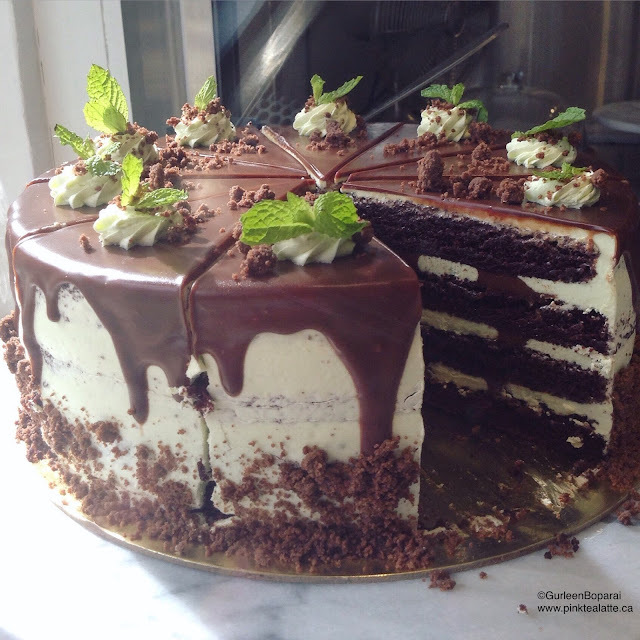 The Mint Chocolaty Chocolate Cake from Liberty Bakery. So mouthwatering to look at. Today marks the official start to my birthday week! I turn 22 on Sunday October 25th, so the seven day countdown has begun! This week is going to be full of fun birthday related fun; where to get the best tasting birthday cakes to setting up a gorgeous birthday table! Plus outfits to make you feel like the queen of the day! Since I am a huge pastry lover, today will be all about my picks for getting the yummiest birthday cake from. For me, it is all about the taste, the cake can be breathtaking, but if it does not taste great, it is not a winner for me. My Yellow Pages Smart List on Where to buy the perfect Birthday cake in Vancouver is live! I am slightly biased here because I am getting my own birthday cake made by the head pastry chef at Liberty. But there is a reason as to why I chose Liberty, it is because they make mind blowing tasting cakes! Not to mention their cakes are beautiful. I love that they are naked iced cakes with minimal decorations. The simplicity is what makes the cakes so beautiful. I will reveal to you my cake flavours on Sunday, but I promise it will be worth the wait! If you want a traditional birthday cake, Butter does it best. The fact that their name is Butter only tells you that their cakes are the real deal. Their butter cream is soft and melts in your mouth while the sponge is fluffy and airy. I have had a Thierry birthday cake in the past years and gotten it for my friends birthdays too. Honestly, they do alcohol in cakes best. Take my word for it, the tiramisu cake well give you a happy buzz while delivering on exceptional flavour and texture. Not to mention the cakes are works of art! This french patisserie are experts in making cake. With every bite, you will feel as though you are in Paris sitting under the Eiffel Tower. Cream puffs are done best by Beta 5, but did you know that Beta 5 does a Cream Puff Cake! It is layers of their decadent pastry cream, sponge and covered in cream puffs. I cannot wait until the holidays, I bet they do a fabulous croque en bouche! When I was younger, the cake to have at your birthday party was a DQ Ice Cream Cake. However, now that we are older and have sophisticated palates, it is time we had a frozen cake to match. Bella Gelateria does Gelato Cakes with their many award winning gelato flavours. You cannot go wrong with a Sorbetto cake either! Plus Sorbetto cakes are vegan and gluten friendly; therefore, everyone can enjoy a slice! These are my go to places for a birthday cake. You can go either traditional with Butter, boozy with Thierry, fancy with Faubourg, creamy with Beta 5, complex flavours with Liberty or stay a child at heart with Bella Gelateria. Where do you love getting your birthday cake from? Let me know in the comments below!